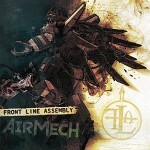 Front Line Assembly has signed on with Carbon Games to score an original album for their game AirMech. The album will be packaged with exclusive in-game content consisting of FLA band member pilots and a limited edition AirMech designed with input from the band. Front Line had previously created music for Quake III: Arena.